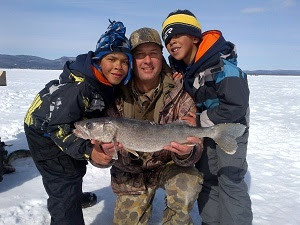 The first of several free fishing days in New York State for 2017 will take place next weekend on Saturday, February 18 and Sunday, February 19. During these designated days, New York residents and non-residents are permitted to fish for free without a fishing license. Anglers are reminded that fishing regulations remain in effect during these days. Free fishing days are the perfect opportunity for both beginning anglers that want to learn more about fishing and also those interested in getting back into the sport. Of New York’s 7,500 lakes and ponds and 70,000 miles of rivers and streams, exceptional fishing opportunities aren’t far away! Those new to ice fishing are encouraged to download the Introduction to Ice Fishing chapter of DEC’s new I FISH NY Beginners’ Guide to Freshwater Fishing for information on how to get started with ice fishing. Additional information, including tips on ice fishing safety and a list of waters open to ice fishing, can be found at DEC’s ice fishing web page.